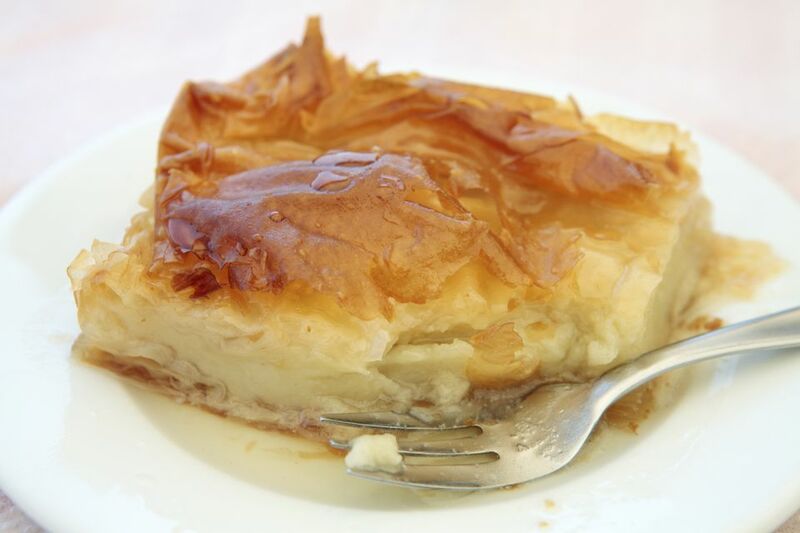 This custard pie is a favorite Greek dessert. If you can get past the tongue twister name, Galaktoboureko (gah-lahk-toh-BOO-reh-koh) can easily become your favorite Greek pastry as well. It’s a divine combination of creamy custard and flaky phyllo dough that is baked to golden perfection and then drenched with a lemon and orange infused syrup. The only caveat is that this dessert is best served the same day it is made. Once refrigerated, the custard tends to harden and loses its lovely texture. So make sure to leave time to prepare, bake, and enjoy the same day! Note: while there are multiple steps to this recipe, this custard pie is broken down into workable categories to help you better plan for preparation and baking. In a large saucepan, heat the milk over medium-high heat until just boiling. Add the semolina and stir with a whisk. Lower the heat to medium-low. Using a whisk, beat the egg yolks with the sugar in a bowl. Ladle a cup of the warmed milk into the egg mixture to temper. Then add the egg yolk mixture to the saucepan. Continue to cook over medium-low heat until the cream starts to thicken, stirring continuously. Using a pastry brush, brush the bottom and sides of a 9 x 12-inch rectangular pan with melted butter. Begin by layering sheets one by one in the bottom of the pan, making sure to brush each one thoroughly with melted butter. You will use approximately half the phyllo sheets for the bottom of the pastry. When you have almost layered half the sheets, drape two sheets of phyllo so that they extend half in the pan and half out of the pan horizontally. Add the custard in an even layer on top of the sheets, smoothing the surface with a spatula. Fold the phyllo sheet flaps in over the custard layer. Then add the remaining sheets on top, brushing each sheet with melted butter. Combine the sugar and water in a saucepan and mix together. Add the lemon peel and orange peel and boil over medium-high heat for 10 to 15 minutes. Remove the lemon and orange peel and stir in the lemon juice. Remove from heat and set aside to cool. Do not pour hot syrup over the hot custard. Allow both to cool to room temperature and then carefully ladle the syrup over the galaktoboureko and allow time for it to be absorbed. Once absorbed, serve and enjoy!